Last night Brian and I needed some room to think so Brian “banished” the kids to their room and put up the baby gate. To deal with the emotional trauma of being thus distanced from the adults, Lance and Ivy made up a game: Throw everything that can be moved over the gate. I kept glancing in their direction as shoes and toys bounced into sight but they were laughing and not fighting, and it couldn’t be that bad, right? Brian said not to worry myself about it, he would clean it up. When we were through we went to survey the damage. 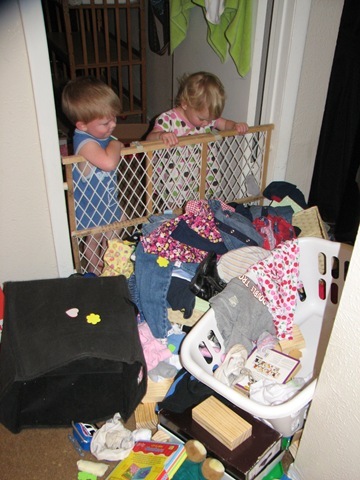 Every toy, block, shoe, some craft items and their clothes had been mixed together on the other side of the gate. I decided to help with the clean up anyhow. Wow! That’s quite the accomplishment. WOW is right! But hey…at least they were quietly playing! 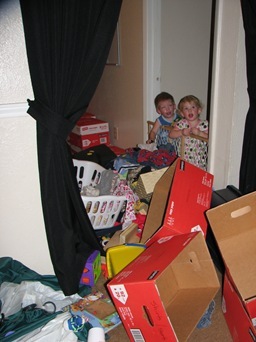 These days if our two aren’t fighting with each other we leave them be….messes can be cleaned up….by them now that they are old enough! Oh, but they look so innocent in the first picture. Haha… that is so great! (Since it is you and not me. My day will come soon enough, I am sure. longer than it took me to clean it up, then I came out ahead.